Update! This task is now published. Here's a link. For each set of shapes, write down whether you think they are the same or not the same, and explain why you think so. Each group was given a printout of the six set of shapes. (I printed one set per half-sheet, and chopped them into 6 half-sheets before class.) Tools provided for their use (in small bins casually opened on each table without explanation of how they were supposed to use them) were patty paper and scissors. The mathematical purpose of the task was to begin to develop a definition of "congruent" based on transformations. That a figure is congruent to another if every point on it can be matched up with every point on the other through a series of reflections, translations, and rotations. One group: "We said set C is not the same because you have to flip it." Other group: "Wait a minute, we said set C is the same because we thought flipping was okay." Yet another group: "So which is it? We said they are the same." Me: "... ... ... because... ?" Other news: my poker face is amazing. To bring it all together, I wrote on the board "Our definition of the same" and wrote down all the things they hashed out that were okay and not okay. There was disagreement. Some particularly spirited disagreement over sets B (the lightning bolts) and D (the four equilateral triangles... or is it really only two figures? ), in particular. If you saw my tweet about the kid thinking like a topologist, he had a passionate defense of his assertion that set B was the same. This was a 100-minute block period, so we had the luxury of letting the discussion happen. Then I said, okay, so here's a little secret: what we think of as mathematics is just the result of what everyone has agreed on. We could take our definition of "the same" and run with it. In geometry there's a special word "congruent" where specific things, that everyone agrees to like a secret pact, are okay and not okay. Then, I erased "the same" and replaced it with "congruent," and made any adjustments to the definition to make it correct. They had heard the word congruent before, and had the perfectly reasonable middle school understanding that congruent means "same size and shape." I said that that was great in middle school, but in high school geometry we're going to be more precise and formal in our language. Next up: how to describe transformations precisely. Day 1 was not so bad. I like to minimally wah wah wah about the syllabus, because they won't remember anything until the information matters, so we all did some math today. Unit 1 is series and sequences so we went in hot with Eating Grapes. Friday she had eaten 100 grapes in all. I read the problem as a story out loud, and asked them to tell me a few things they heard. Then I displayed the text and asked them to read silently, looking for anything that was different from what they remembered. I only showed the scenario, not the question, so next they independently wrote down anything they wondered. We got some fun wonderings like, "Does Angela have an official diagnosis of OCD, or... I mean, Miss Nowak, who counts grapes?" but focusing on questions we have the power to explore mathematically, quickly settled on "How many grapes did she eat on Monday?" They had five minutes of silent individual think time, though some couldn't help themselves from discussing with their groups and I didn't really enforce silence. Then their groups (of 3 or 4) were charged with reaching consensus on a solution and writing it on chart paper so everyone could see. (Not just the answer! Make your thinking visible! I want to see how you arrived at your answer! What was the thought process? No more than half your solution should be numbers! etc etc). 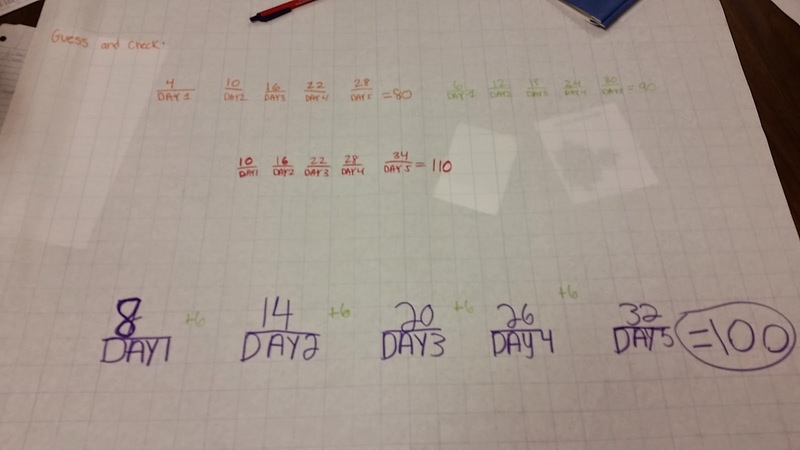 Where I struggle is, books like 5 Practices, and the anticipated answers given by Math Forum, kind of assume every group is going to do it correctly, just in a different way, and the teacher's job is to sequence the different solutions appropriately. I have seen little guidance on how to provide minimally-invasive help to students who have misunderstood something about the problem, but don't realize that their answer is wrong. They were sure they were right because 16 works in their equation, but they weren't checking if 16+22+28+34+40 added up to 100. What I did was, encourage them to use common sense and see if starting with 16 would get her to 100 grapes by the end of the week. What I should have done, I think, was interrogate them about where the 4 and the 6 came from. As a result, they fell back to guess and check, but for some reason only added up four days, because "we don't know how many she ate on Monday." They said the answer was 10 grapes on Monday, because 16+22+28+34 = 100. Interesting, right? If you can read it, their answer was 76. They may have had two misunderstandings about the problem: that Angela ate 100 grapes on Friday instead of 100 grapes in all, or that Angela only ate 6 grapes every day Tuesday through Friday, instead of six more than the previous day. I think it was the second one. We went around and around. I tried saying "Well look. If she ate 76 grapes Monday, and 82 grapes Tuesday, she's already eaten 158 grapes. But we know that she only ate a total of 100 in the whole week" but it was like we were not speaking the same language. What to do about kids who are trying to do nothing, and hope that if they are quiet, I don't notice? Group work enables this behavior, because their group can still produce something without them. I don't think "roles" is the answer, because you can be "resource manager" or whatever and still not do any math. I don't think "everyone turns in their own work" is the answer, because then there's no compelling reason to talk to each other. How to present work so that everyone learns something about why the correct solution is correct, and ideally, learns some math I am trying to teach them? Again, 5 Practices acts as if the four anticipated solutions will show up in your classroom and it's just a matter of choosing what order to talk about them in. What about groups that do not reach a correct solution? How do you discuss their work without embarrassing them? (I think the answer is lots of deliberate growth mindset interventions, but man, it's the first day of school and the last thing I want to do is make a kid feel bad for trying.) What if (like today) no one makes a diagram? Do you generate your own teacher diagram on the fly, for illustrative purposes? What about students who are super-reluctant to speak to the whole group? Is it okay if the teacher explains their work, and maybe asks them some specific clarifying questions along the way? Help me, people who know what you are doing. I need you. Hey! If you haven't heard, I'm back at it this year, teaching Geometry and Algebra 2 at local public high school. Mathalicious has picked up and headed west to continue doing their great work. Writing real-world lessons and helping operate a business (or trying to help, anyway) was educational and stimulating. I didn't predict how much I'd miss the day to day work of teaching class, though. I get to work with the relentlessly charming Lois Burke! Along with many new awesome colleagues. The Geometry team, in particular is hungry to do some really good things. It's me along with three dudes I just call the Matts, because although they have many wonderful individual qualities, they are all named Matt. We have agreed to plan together and teach one new lesson per unit, observe each other, and meet weekly, which in my opinion is a prodigious start. I don't have much to share at this point. I'm trying my best to resist the whirlwind of time-consuming stuff that I often let clutter up my thoughts about school. I don't need to read any more books. I don't need a 37 point checklist. I don't need to hang up 95 posters. I need to organize some simple tools and plan some good lessons and take many, many deep breaths. My plan for f(t) is to record some really tedious minutiae about what I planned, how students responded, whether they learned anything, and what I did about it. I want to focus energy on the colleagues in my physical presence who are willing to negotiate ongoing collaborative work with me, but I'll also be grateful for new and continuing conversations in my online faculty lounge. Happy new school year, everybody. Below are several situations which describe a relationship between two quantities which are each noted in parentheses. Your goal is to determine which of these relationships is linear. To help you decide, consider creating a table of values to compare the quantities specified in parentheses, graphing the relationship on a coordinate plane, or writing an equation to represent the relationship. Make sure to define any variables clearly, with appropriate units. The price of bananas at the Italian Market is $2 for every 3 pounds (cost and pounds). Tamika plants a tree that is 3 inches tall, and it grows 6 inches per month (height and months). Rhys folded a strip of paper that is 120 cm long into halves over and over so that its length shrinks by half each time (length and number of folds). The perimeter of an equilateral triangle is three times its side length (perimeter and side length). Malcolm bikes for half an hour at 30 miles per hour, followed by an hour at 15 miles per hour. He rests for half an hour and then bikes at 20 miles an hour for 1.5 hours (distance and hours). The area of a circle is π times its radius squared (area and radius). 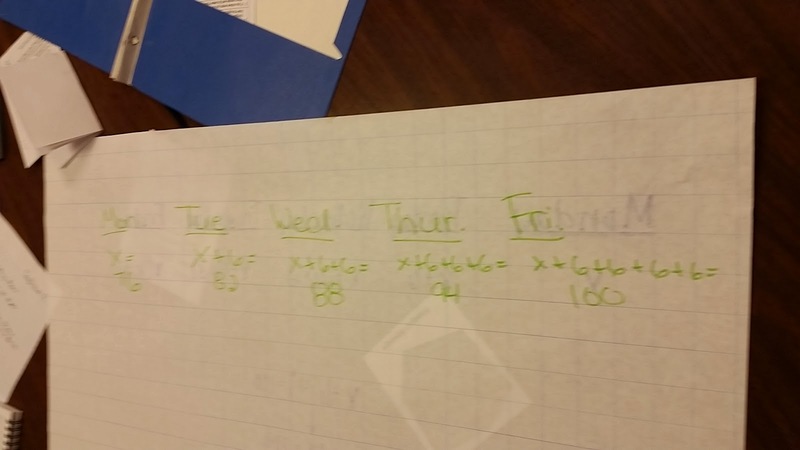 A teacher plans to grade exams for a whole day, and estimates that she grades 8 exams every 30 minutes (number of tests that have been graded and minutes). What are some properties you used to determine whether a relationship is linear or non-linear? 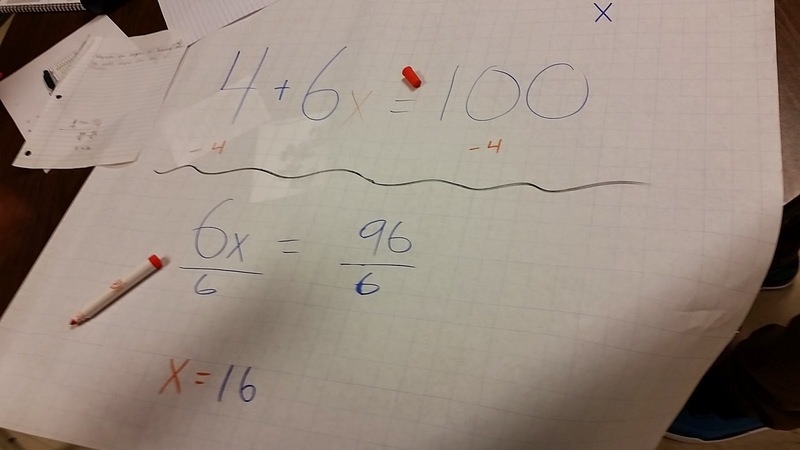 This task uses concrete examples to help students notice the traits of linear relationships in different representations, and prepares them to see the connections between proportional relations, lines, and their equations for 8.EE.B. Since the given scenarios cover a wide range of contexts, what makes a relationship linear may not be easily discernable by reading the descriptions. Translating them into tables, graphs, and equations enables students to spot and articulate regularity and structure in situations that produce line graphs (MP7, MP8) and to generalize these regularities as clues of linear relations. Two of the scenarios (b and h) involve non-proportional, linear relationships. A teacher may opt to leave them out if she wants to focus on constant rate of change without the added wrinkle of accounting for a starting value. As an instructional activity, there are many ways to implement this task. For example, a teacher could create cards showing an equation, table, and graph for each scenario, and turn it into a matching activity. This approach would decrease the level of difficulty substantially, but in skilled hands, could still provide fodder for a rich conversation about the features of a situation that imply a linear relationship. Another approach might be to "jigsaw" the activity. One team of students might be responsible for creating tables, another graphs, and another equations. The teams could reconfigure to contain one student using each representation, and work together to see if their representations are consistent. They could write down some characteristics that tell you whether a situation is linear or non-linear, leading into a whole-class discussion. An equation is provided, when possible, to provide the teacher with succinct information about the relationship. Students may frame their arguments by creating tables or graphs and using them to support their reasoning, and some samples are provided. The important characteristic of a linear relation is for the quantity to exhibit a constant difference over consistent intervals. a. Linear. Let c = cost in dollars and p = weight in pounds. b. Linear. Let m = number of months and h = height in inches. h=6m+3 Note: since the tree will not keep growing at the same rate forever, this equation only works for reasonable values of m. Students may discuss how they might limit what values were "allowed" for m.
c. Not linear. Let n = number of folds and L = length in cm. L=120(12)n where n can only be natural numbers (you can't fold a piece of paper 4/5 of a time, for example). d. Linear. Let P = perimeter in any units of length and s = side length in the same units. e. Not linear. At certain time intervals, his distance traveled is linear, but he does not have a constant rate of change for his whole trip. f. Not linear. Let r = radius in units and A = area in square units. g. Linear. Let m = time in minutes and T = number of tests that have been graded. h. Linear. Let s = step and N = number of squares. N = 3s + 4, where s is a natural number. i. Not linear. Let s = step and P = number of pebbles. P=(s+1)2−1 where s is a natural number. The difference in the y-values is −15 − 22 = −37. The difference in the x-values is 7 − (−8) = 15. One of the three lines has a slope of zero and one of the lines has an undefined slope. Determine which of the lines has slope zero and which has an undefined slope. Create two points, D and E (different from A, B, and C), that define a line whose slope is zero. State their coordinates and graph them on the coordinate grid along with line DE←→. Create two points, F and G (different from the preceding points), so that the line joining F and G has undefined slope. State their coordinates and graph them along with line FG←→ on the coordinate grid. Describe the characteristics, in terms of coordinates and graphs, of lines that have a slope of zero. Describe the characteristics, in terms of coordinates and graphs, of lines that will always have an undefined slope. The "change in y divided by the change in x" can be computed for any two points in the plane... unless the points have the same x-coordinate. The purpose of this task is to help students understand why the calculated slope will be zero for any horizontal line and undefined for any vertical line. This task is based on Slopes Between Points on a Line. In that task, students argue that for any two points on a line, the "slope triangles" have to be similar, and as a result the lengths of the sides of the triangles will be proportional. This is why the slope between any two points on a particular line will always be equal, and why we talk about "the" slope of a line. This task investigates a degenerate case where "slope triangles" can not be constructed, since the line is parallel to one of the axes. This instructional task is intended to be used in a class discussion. Students can work on part (a) independently or in small groups. The class could discuss their answers before proceeding with the remaining parts. Students should be given a chance to try to create descriptions for part (d) and (e) on their own. Some may notice the graphical requirements, and some may notice the requirements of the coordinates. Both of these should be discussed and understood by the whole class, and the ideas should be connected to the slope-calculating procedure introduced at the beginning of the task. a. Possible response: Calculating the slope for AC←→, we get 3−318−2=016=0. The slope of AC←→ is 0. Calculating the slope of BC←→, we get 11−318−18=80, which is an undefined value. The slope of BC←→ is undefined. Another possible response: Looking at the graph of AB←→, I see that when x increases by 2, y increases by 1. I know that this means the slope of AB←→ is 12. Looking at the graph of AC←→, I see that for every change of 1 unit in x, there is zero change in y. I suppose that this means the slope of AC←→ is zero. When I look at the graph of BC←→, for every 1 unit of change in x, well, it's kind of crazy. 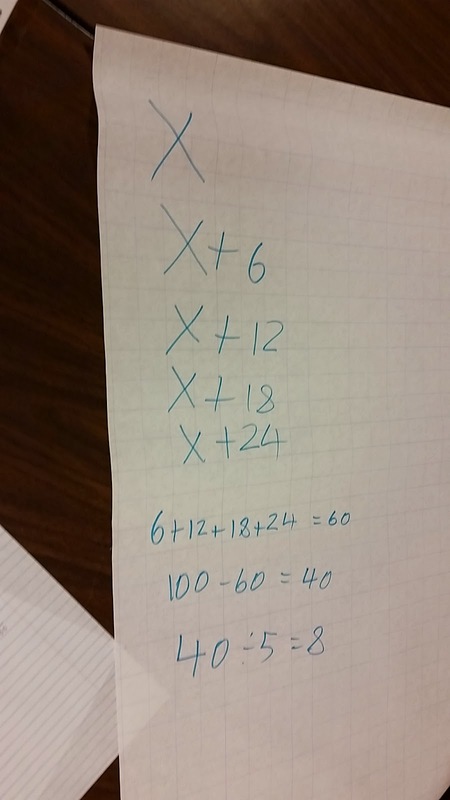 All of the line happens when x is 18. I don't know how to say how y changes for every 1 x. I suppose this means the slope of BC←→ is undefined. d. Lines whose slope is zero are horizontal. Two points on the line must have the same y-coordinate. e. Lines with an undefined slope are vertical. Two points on the line must have the same x-coordinate.